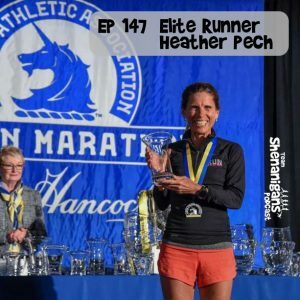 In this episode, Caryn introduces us to her friend and running coach, elite runner Heather Pech. After a very successful business career, including stints as CEO of Polo Jeans and Nine West, Heather has found great success as a masters runner, winning her age group in the 2017 and 2018 Boston Marathons, including setting a personal record despite the horrible conditions at Boston in April. Heather discusses her aggressive training regimen, her work coaching elite youth runners and how some of the same skills that made her successful in business have translated to success in running. You can follow Heather on Instagram @_KnightTraining or @HeatherPech.